This cabin bed has been painted in bone white with the doors and drawers being painted in Lillac to match the surrounding room. 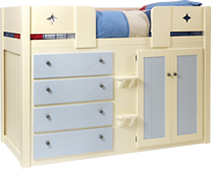 The bed fits nicely in the space and allows for plenty of storage with the 4 drawers on cupboard space. This bed has also comes with 2 clip on shelves which are £25 each. Features also include, brushed chrome door knobs and star cutouts on the front rails. We think the bed fits in perfectly with the space theme and with a little childish imagination could be a spaceship blasting off into the galaxy!